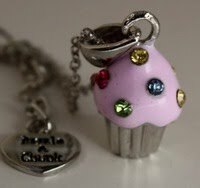 One lucky follower of Babbling Brooke will receive a brand new cupcake necklace from Dazzle & Chunk. This 16" necklace features eight rhinestones set in a pink iced cupcake charm. To win, visit Dazzle & Chunk and pick what your favorite charm is. And for additional two bonus entries, blog about this giveaway.